BOOKTRYST: Are You The Newspaper You Read? A reader of The Star. Be careful, you are what you read - specifically, your newspaper of choice. Who are you if you read the New York Times, the New York Post, the Daily News, or any of the other metropolitan newspapers across the United States (or anywhere) that still survive? How about the National Enquirer, or the World Weekly News ("The World's Only Reliable News!" if you follow the latest on Nessie, Big Foot, or the three-legged pygmy accountant by day werewolf by night)? A reader of The Daily News. Acclaimed illustrator Kyd, pseudonym of Joseph Clayton Clarke, dipped his brush in droll wit and skewered the average reader of London's most popular newspapers of the late 19th - early 20th century in a singular suite of original watercolors, Some Typical Newspaper Readers, executed c. 1900. 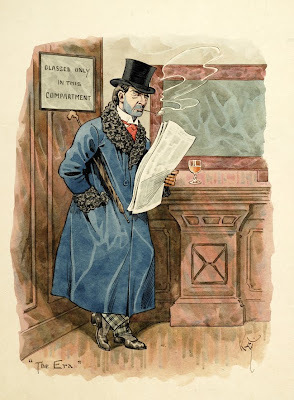 'Tis a sad fact indeed that while there were once many newspapers competing for readers of all classes and tastes - Clarke lampooned twelve published in London alone - many cities now have only one. How can you judge yourself against a single paper? A reader of The Era. Joseph Clayton Clark (1856-1937) worked as a freelance artist with a particular affection for Dickens, his Dickens illustrations first appearing in 1887 in Fleet Street Magazine, with two collections soon to follow: The Characters of Charles Dickens (1889) and Some Well Known Characters from the Works of Charles Dickens (1892). A reader of The Sporting Times. In the first decade of the twentieth century, five sets of postcards based on his Dickens drawings were published, and seven sets of non-Dickensian comic cards by him were issued. 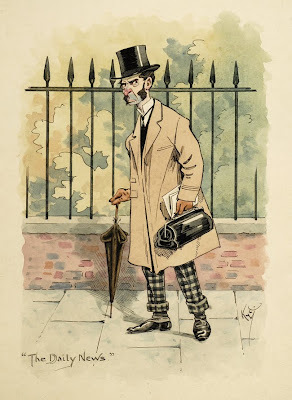 Beginning in the 1920s, he earned his living from watercolor sketches, mainly of Dickens' characters, which he sold to and through the London book trade. Frederic G. Kitton gives him early notice in his classic text, Dickens and His Illustrators (1890); Kyd's watercolors were at that date already being avidly bought by major Dickens collectors (Kitton, p. 233), the Cosens sale in 1890 successfully selling a collection of 241 of Kyd's Dickens watercolors, and Mr. Tom Wilson, at the time the foremost collector of Dickens, possessing 331 of Kyd's drawings. A reader of The Times. 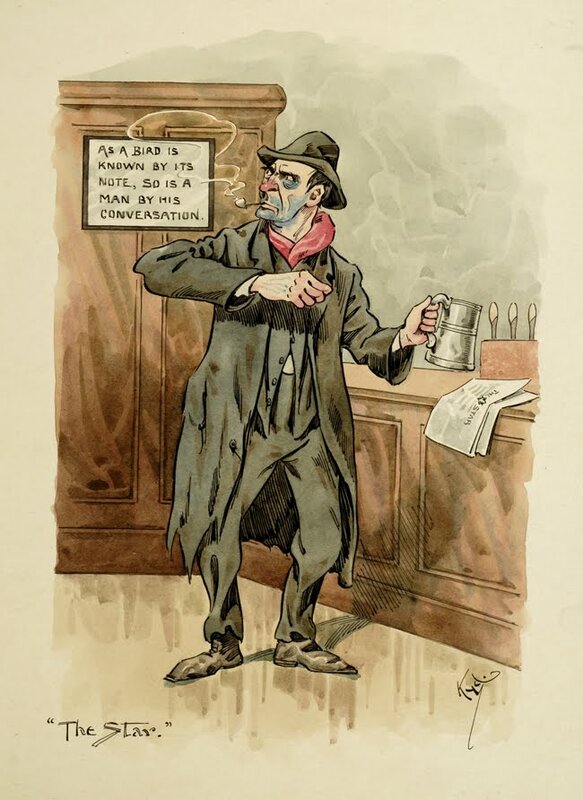 "As a character 'Kyd' emulated those of Dickens and his own illustrations - slightly larger than life. In his style and dress he was mildly flamboyant for the period…He seldom varied his attire from a grey suit, spats, homburg hat, gloves and was never without a carnation or substitute flower in his button hole" (Sawyer, Richard. "Kyd" (Joseph Clayton Clark): A Preliminary Study of his Life and Work Together with an Essay on Fore-Edge Paintings, 1980. p. 7). A reader of The Referee. 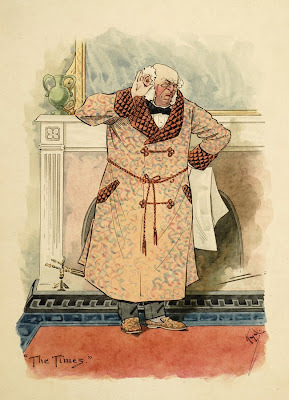 "The vast majority of 'Kyd's' works which are offered for sale today are single-character studies…Far more rare are character studies with backgrounds" (Sawyer), as here. Rarer still are non-Dickens or playing card themed work. Thus, this is an exceedingly scarce suite of watercolors not noted by Sawyer, and quite likely unique. 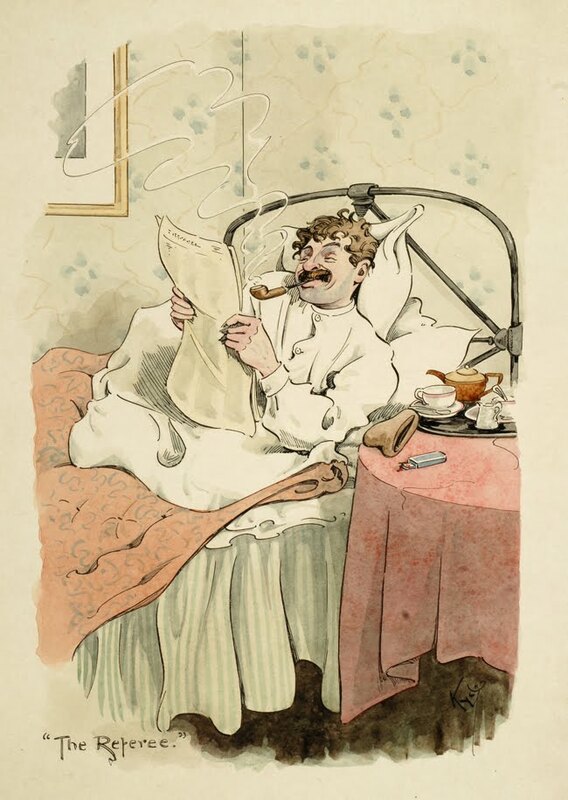 It's closest relatives appear to have been two of Kyd's post card series: The Book and Its Reader, a set of six cards humorously depicting the artist's idea of types of readers of contemporary popular novels (oh, to see that! ), and London Types. A reader of The Daily Mail. With so much news content now delivered through the Internet we may never know the personal character of Web-based newspaper readers. With annoying banner, sidebar, pop-up, open-collapse, etc. ads, it may be that those of us who've come to depend upon Web-based news services are or may soon become like Kyd's impression of the Daily Mail's average reader. But, take heart, there is no shame in being crazy for print. 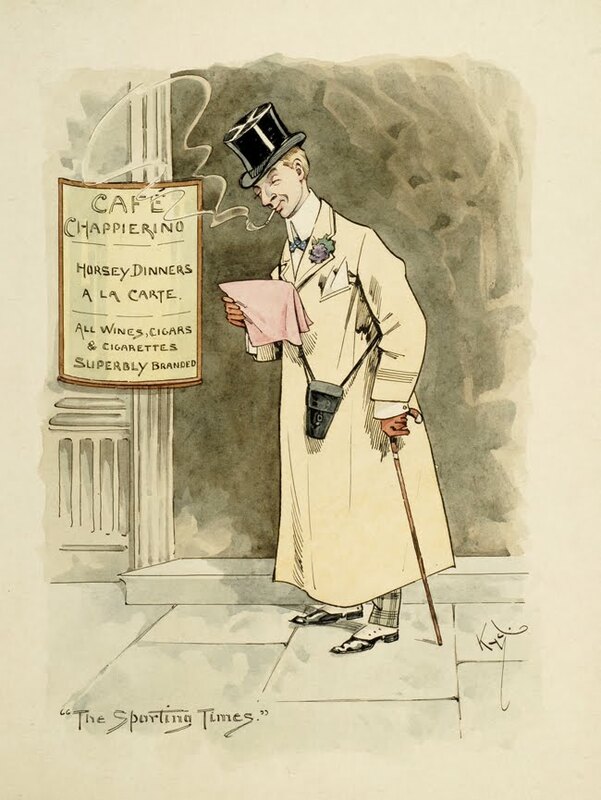 KYD (pseudonym of Joseph Clayton Clarke). Some Typical Newspaper Readers. A Series of 12 original Humourous Sketches drawn in colours by "Kyd" (Clayton Clark). [London, c. 1900]. Ten (of twelve) original watercolors each titled and signed by the artist, and with full backgrounds. Loose in original portfolio illustrated and titled in black ink by the artist on the front cover. 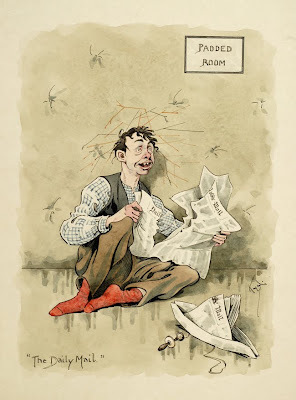 Booktryst invites readers to suggest current newspapers that might best be read in a padded cell, as Kyd has caricatured the above reader of The Daily Mail. The German Bild-Zeitung is definately high up on the list of padded-room reading matter! 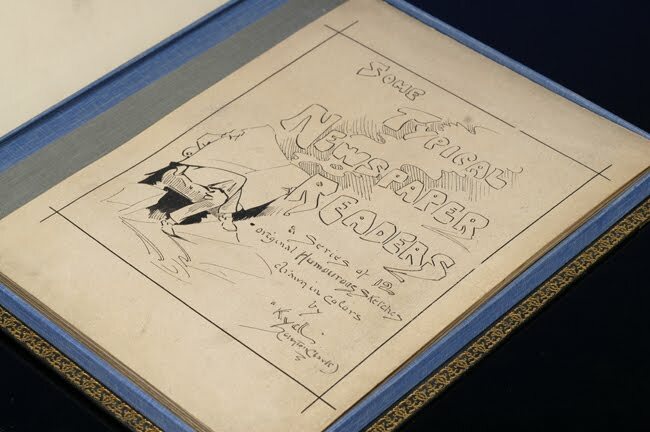 I have several Kyd items but they are about Oliver Twist, Nancy, etc -- they seem to be water colors and signed KYD - are you familiar with them?